With my Little China Doll growing up and ready to sleep in a ‘big girl bed’ a room shuffle was set in motion and my Little Scientist is the first in line for a room makeover as I need to move him out of one room first, so I can then move her into her pretty new little girls room. For those following my blog, I have already shared with you a bit of a sneak peek, with some things we made for this room using a VERY budget friendly material. Now I’d like to take you on a tour of the whole room and show you a couple of my other favourite features. The general feel of this room is kind of industrial and vintage. While keeping in mind things that an almost-seven-year-old boy loves and ‘needs’. (eg. LEGO, LEGO and more LEGO!). I hope you enjoy the tour……. This is the feature wall. I pondered what shade of blue to paint this wall for ages but ended up using one called “Stained glass” (35Cb-2) by Taubmans. It is a nice deep colour but still has a lovely softness and warmth about it. My son helped make the artwork for these frames to match the bed spread, which take pride of place as the focus for the room. It’s such a simple project, using glow in the dark stickers and some pieces of cardboard. A friend bought my Little Scientist this giant dinosaur skeleton a while ago. We painted it using some paint I had bought for my daughters new room makeover (which I am already starting to work on). It just happened to match in with his bed spread perfectly! I think it really is a great bold and fun addition to the room. This shelf collection has a few sentimental items for display that kind of go together (in an eclectic miss-matched kind of way!!??). The Lamp I picked up from a local antique store along with the metal trolley that we are using as a bed side table (below) and the painting was made by my Aunty. I love the industrial feel of this metal trolley I found from an antique store to use as a bedside table. Complemented with an industrial lamp and this tissue box I made . I think this bedside table really sets the scene. It is also very handy being on wheels for when I want to move it out of the way, to use the trundle-bed for guests. As I mentioned earlier, I have already written a post with details about this bed spread and the matching bunting we made. The cushions on the bed were another great find from IKEA for just a few dollars. I was so excited when I found them stocked in EXACTLY the colours I needed! The shadow box is one I had in my room (and LOVED) as a little girl. It is filled will all sorts of little trinkets my son owns that I could find around the place. eg little toy cars, a soccer trophy, a transformer, and marbles. I especially chose small trinkets I could find with a vintage feel (eg. buttons, dice and an old LEGO mini fig) or with colours already featured in the room eg. the green robot wind up toy or bouncy ball. I suspect the items will be swapped and changed many times in years to come as he makes it his own space, that’s all part of the fun! I did up this old TV many many years ago by taking out the insides and adding a light to the back. It was originally repurposed as a fish tank. The fish unfortunately died long ago and it has been gathering dust in our shed for quite a while now. I was so excited when I had the idea to use it in this room to become a display cabinet for my sons favourite LEGO. I painted the inside of it black and attached a hook inside the top so that the helicopter can appear to be flying in motion thanks to some fishing line. I was also lucky to find a box for storing all the general Lego that fit perfectly under it. Win! The wardrobe is not the most glamorous space in the bedroom but it is certainly a space that needs to be used well. We don’t have a big cupboard in this room and I needed something that would work well for my son so that he could manage his clothes himself (independence is key when you have more than one child!). I find these hanging shelves super useful for PJ’s, shorts and some school sport shirts, plus, I bought some little drawers that fit in one of the levels together to use for socks and jocks (I think they are actually supposed to be for shoes!!??). We hang school shirts on the left and other shirts on the right. The two boxes at the base are used, one for jumpers and the other is for dirty clothes that my Little Scientist then takes to the laundry each week for washing. The system seems to be working well so far. The other side of the wardrobe is less accessible, so I store the clothes there that we are not currently using. I have another set of hanging shelves just like the one in this picture for warm stuff. Currently it has winter PJ’s and long pants etc. ready to be swapped with the other in the cooler months. Long sleeve shirts are also hanging on the other side of the wardrobe. I think a bookshelf is a must-have in any child’s bedroom to foster the love of books. Plate stands are a great way to display a favourite book or two. The paper balls we made add a nice decoration to tie in with the rest of the room and, in my opinion, every kid needs a container to put his favourite bits and pieces. In his previous bedroom, this was a hidden compartment under a custom-made stage. Well, it’s not as exciting as that this time round but the cute pouch does the job just as well. Did you notice the dinosaur? We painted this one silver (to match the frame of the bed and other items in the room). A green box on the bottom shelf of this bookcase for Lego magazines makes this area a very popular place to visit. (Psst…. By the way…… Did you know you can sign up for LEGO club membership FOR FREE and get four magazines delivered each year? My son LOVES receiving these in the mail, reading the lego comics and replacing the poster on display on his wardrobe.). The third main wall in this boys room is dedicated to a practical working space with a desk and storage. This desk space will come in handy more and more as my son grows older and has more homework etc to do. Of course I had to buy a silver chair to carry on the industrial feel of the room. The blue trolley under the desk helps too (though, it is my least favourite item in the room and I would like to replace it one day). The square tray on the desk comes in very handy for building the current LEGO sets on. My son can push the tray with all the pieces on it to the back when he needs to so that it is safe and out-of-the-way until he can return to it to work on again later. The silver document tray makes a nice practical addition adding to the industrial feel too. The shelf at the back of the desk is elevated to be in line with the Lego display shelf next to it so that it all ties together. I used four wooden posts cut to the correct length to achieve this. I added an industrial feel to them by using this rustic metal paint effect ( which is the same way I painted the tissue box on his bedside table) and attached them with some nice looking metal brackets. I looked everywhere for a metal magnetic board as I thought it would complement the silver bed frame and industrial feel nicely…..and again, yep you guessed it, IKEA saved the day! (can you tell I love IKEA?!) With some more special trinkets on display plus this old number plate from the first car I drove (who knows why I still have it! Or how I got it), it makes another nice little focus point in the room. Well, this is a seven-year olds bedroom after all, so of course he gets a whole shelf dedicated to storing his favourite LEGO sets and other favourite toys. He can keep some sets on display too along the top, which he loves. I have found with LEGO that it’s nice to have a general box with a few sets mixed in it. But the more complicated sets are more likely to be used if they are kept separate in a labelled box or on display. So there you have it! A full tour of my sons industrial / vintage style room makeover. I hope you have enjoyed reading about it and perhaps found a few ideas you could incorporate. If you are wanting more inspiration for a similar style room, you can check out (and follow) my Boys Industrial Bedroom Board on Pinterest. Also, you can check out my photo on Shutterfly along with a wonderful collection of other creative bedroom ideas! My son really does love this room and spends almost every moment he can relaxing in this space. Just this week after I tidied his room up to take the photos for this BLOG post (because, lets face it, we all know this isn’t how the room looks most of the time!). He has announced, totally out of the blue that he is going to make his bed every morning from now on because it looks so great! Now THAT’S what I call a happy customer. ….. shame that idea was forgotten the next morning…. I would like to add that if I could, I would have loved to incorporate some industrial shelving like these. But alas, I would have needed wooden floor boards and permission to drill into them! (highly unlikely) So that idea was put to a halt pretty quick. If you liked this post, you may also be interested to check out my daughters shabby chic inspired bedroom or our Gender Neutral Baby room. I am linking up with The Plumbette and The Builder’s Wife for “Home Improvement Thursday” today. What feature in this room is your favourite? What could I add to make it even better? What theme do you have in your child’s bedroom? It looks awesome Clare. I had to do a double take when I looked at the old TV and thought there was Lego in there. What a clever thing to do to upcycle an old TV. I’m so glad you linked up today. The room looks so good and I bet your little man loves it too. Now lets see how long it will stay that tidy…. Every time I help tidy my girl’s rooms, they end up messy again!! What a fantastic space!! I especially love the old TV and the colour on the feature wall is just gorgeous. A great room, well done! 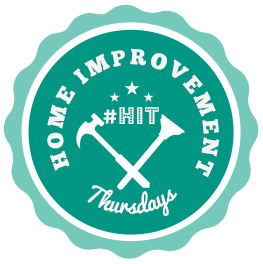 Thank you for linking up with #HIT! Thanks Nicole! I took ages to settle on the shade of Blue for the wall. I think the Bunnings man was getting annoyed at me as I kept coming back to try another shade. lol. I am very glad with the colour in the end though, even if it did take a few paint sample tin purchases to get it right. What a cool space for a young boy! My nephews would love a room like this! Love the old tv display idea – brilliant! Well done. I absolutely love the shadow box shelves with the vintage style trinkets in it. How special that it was yours as a child. The completed room looks fabulous, Clare. Thanks Amanda, I am glad you like it !….. wait till you see my daughters room reveal! It’s very pink and girly. I wish I could find another shadow box for her to have one as well. hmmmm we might need to go on another antique shop crawl some time !!??? Oh wow what a fantastic bedroom. Love the feature wall, and the industrial trolley.